Voted as one of the top ten destinations for retirees, this country offers a great quality of living, natural beauty, modern infrastructure, and safety. Another reason to retire to Mexico is its close proximity to the United States, which in turn gives you more flexibility in making your retirement move. You could take weekend trips to any cities in Mexico to look at living accommodations; it could be a coastal beach, on either the Pacific or the Atlantic Ocean. Why Mexico? Well, for one thing, this country combines old traditions with a contemporary lifestyle. It is very easy to acquire a residence Visa, and the amenities and services they offer to retirees makes this country consistently among the top 10 places to retire. Another benefit is that housing, goods, and services are affordable. You can own beachfront property in Mexico for less than $100,000. Because Mexico is so diverse and rich in culture, you can find exactly what you want, whether it is beautiful, warm oceans, tropical lakes, majestic mountains, gorgeous deserts, small towns, or sophisticated cities. México City was once the center of the Aztec empire. Today, it is a thriving business center. Zócalo, or the town square, is built on the same spot where Montezuma's palace once stood. Many of the old mansions and public buildings in the area were built hundreds of years ago using the stones from the Aztec temples that were destroyed by the Spaniards. The Zócalo is Latin America's largest main square and has the second largest street market in the world. Once known as the City of Palaces, Mexico City has two areas of importance: The Centro Historico, comprising historic and religious buildings such as the Cathedral Metropolitano, which is one of the most important architectural structures in the Western Hemisphere. The Palacio Nacional has incredible Diego Rivera murals that chronicle this country’s history, and the Palacio de Bellas Artes is where the city’s most important cultural events take place. Xochimilco Ecological Park is often called the “Venice of Mexico” due to its beautiful canals. In north Mexico City, you can visit the Basilica de Guadalupe, one of the most visited basilicas in the world. Paseo de la Reforma, the city's main thoroughfare, has often been referred to as the "Manhattan" of Latin America. This boulevard is lined with dozens of monuments including the Independence Monument, which has become the unofficial trademark of México City. 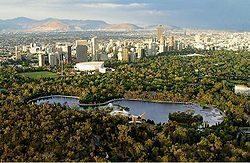 Chapultepec Park is an enormous green area in the middle of this fast-paced city. This park is the city's largest, covering over 2000 acres, and it contains a myriad of the city's attractions, including three of the most well-known museums. Alameda Park, near the Zócalo and Palace of Fine Arts, has been around since1541, and is the city's oldest park. 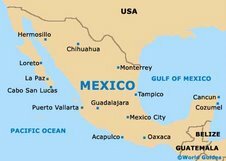 Retire to Mexico and you will find this country to be very affordable. A dinner for two costs about $35; a night at the movies costs under $10; and a taxi ride across town is only a few dollars. As a retiree in Mexico, you can really indulge yourself and enjoy the good life. As you consider a retirement in Mexico, one of your primary concerns will be the availability, quality, and cost of health care. Mexico's health care system is very good and often excellent. Many doctors and dentists have received training in the U.S. and/or Europe. Also, health care in Mexico is much more affordable than in the U.S. Whether your vision of the ideal retirement involves shopping, fishing, sunbathing, diving, biking, mountain climbing, parasailing, collecting crafts, visiting archeological sites, partying, going to concerts, attending the theater, or fine dining - in Mexico you can engage in all these activities, and many more. In recent years, because of the prevailing climate and attractive scenery, a substantial colony of retirees, including many from the United States and Canada, has established itself on the lake’s shore, particularly in the town of Ajijic, Jalisco, located just west of the city of Chapala. Read more information. Guadalajara is a cosmopolitan city; has tree-lined boulevards, parks and plazas, plus pockets of beautifully preserved historic sites that range from ancient ruins to colonial mansions. The Historic Center is an attractive part of the city; taking a tour of local cathedrals and other buildings is very interesting. There are a variety of reasons why there has been an influx of people choosing to retire to Merida over the past several years: the cost of living is low and quality of life is superb. The city has a booming arts community and a rich Mayan culture. Whether its historical buildings, sit in the plazas or dine in the many sidewalk restaurants that you’re into, Mérida has something for everyone. While in a foreign country, you are subject to its laws. information about the countries you will visit.